Originally published in The Crank Report, Issue #5. Debt, debt, yet more debt. Politics, mainstream economics and other popular arenas dominated by feelings and collective notions of what should be right or wrong for all suffer from one major flaw: the inability and inherent reluctance to think critically and learn from fundamentally sound theory and history. For decades, western economies, the economic powerhouses of the world, have wrecked their economies with faulty economic doctrines making but one thing possible: an ever growing mountain of money. “Austerity” is allegedly destroying Europe and especially Greece, some utter. Remember, austerity today doesn’t mean cutting deficits. Instead it merely refers to reducing the speed at which these deficits grow. In the eurozone today, government debt is hovering above 90%. In the U.S., the country that has dominated not only the business world for a century or more, the 100% mark was quickly reached in the aftermath of the 2008 banking crisis. As money is created as debt in this world run by monetary cranks and demagogues and where democracy long gone is nothing short of a system to enter a vote to grab other peoples’ money against their will and ensure politicians and bureaucrats can remain in their ivory towers to continue the gradual confiscation of wealth and productivity, I thought it was appropriate to attempt to take a deeper look at the economic meaning and consequences of debt and shed some light on why economic growth in the two regions is likely to be dismal at best for a very long time indeed. A debt can come in many forms. The one we are concerned with here however is of the monetary kind where one party, the debtor or the borrower, borrows money from another party, the creditor or the lender. The borrower is then obliged to pay back the full amount of the loan to the lender normally according to an agreed down payment plan which includes interest. Through taking on the debt, which usually comes in the form of a loan with contractual terms attached, the borrower obtains increased purchasing power now and less purchasing power in the future. With increased purchasing power, the borrower is able to spend or invest more now than otherwise. Conversely, the borrower, ceteris paribus, will face diminished purchasing power in the future as the loan will have to be repaid. The lender on the other hand gives up purchasing power now for more purchasing power in the future. As a result, the lender is able to spend less now than otherwise as the purchasing power has been transferred to the borrower. If the borrower honours the terms of the agreement, the lender will attain increased purchasing power in the future. As long as someone has actually previously saved the money to be lent out, no specific problems arise. As savings represent production above and beyond consumption, the lender merely transfers the rights to purchasing power to the borrower. Nobody loses (as long as it is based on voluntary terms) and others not involved in the transaction do not suffer from decreased purchasing power as the money supply has not been inflated. This ceases to be true however when banks lend money into existence (which leads to an increase in the money supply). The newly issued additional purchasing power will then enter the market at the expense of other potential uses these resources could have been committed to in the absence of such monetary inflation. The increased supply of money also reduces the purchasing power of the money already in existence prior to the new money entering the market. After all, more money is now chasing the same amount of goods and services as the pool of resources does not increase as a result of the additional money created. As new money is created as debt, the money supply grows when banks issue loans which are not issued on the back of prior savings. The debt we will focus on here is therefore the kind that is lent into existence by banks as made possible only through the very existence of an elastic currency, meaning the quantity of money is able to change rapidly with changing demand and supply conditions. The current elastic money is made possible through government fiat (i.e. law, hence fiat money). Nobody else is allowed to create these fiat monies as it would be considered counterfeiting. In the current monetary system, banks and central banks hence have a monopoly on counterfeiting money. When a bank lends money into existence, it creates an asset (the loan) and a liability (the deposit) on its balance sheet. As bank deposits are money, the newly created deposit is hence newly created money and thus serves to increase the money supply in an economy. The borrower on the other hand records an asset (the cash deposited in his account) and a liability (the money borrowed). Economically speaking, what happens in this transaction is that the purchasing power available to the borrower increases right now while the bank’s purchasing power remains unchanged. Actually, the banks purchasing power will increase once the borrower spends the money and the new owners of the money deposits them back in the banking system. This increased purchasing power stems from the fact that the deposit increases the amount of bank reserves which allows banks to extend further loans or to expand investments through buying government securities and qualifying assets as defined in relevant regulations. The initial increase in spending power of the borrower and unchanged spending power for the bank is in contrast to what happens when a loan is granted from prior savings where purchasing power is merely transferred from one party to another. When new money is lent into existence, the additional purchasing power needs to come at the expense of someone else as the granting of the loan did not increase the amount of resources available in the economy. The elasticity of money therefore makes it possible to impose, or socialise if you will, a loss of purchasing power onto others, i.e. those that did not receive the new money ends up paying for those granted the additional purchasing power. And as banks did not lose purchasing power when granting the loan and actually gains purchasing power once the deposit money is re-deposited, it is the non-bank, non-borrowing public that ends up paying for it. This helps shed light on why banks are so profitable even as their staff are handsomely paid. A portion of society’s wealth is hence transferred gradually and consistently to the bankers during the course of monetary inflation making bankers richer and the real economy poorer in the process. Even the untrained eye has spotted this reality in the U.S. during the last six years and counting. Money lent into existence: future production is necessary to pay off the debt and an increase in future savings is necessary to replenish the initial savings deficit. The future is always uncertain. When banks expand their portfolios of loans unbacked by prior savings this will serve to increase the risk of adverse economic outcomes in the future as savings are depleted and financial leverage increases, e.g. debt in percent of GDP or debt in percent of savings. This is the case independent on whether the additional purchasing power is spent on investments or consumption, though the two have different impacts on how the economy reacts. Fundamentally, what is happening is this: money lent into existence allows a society to undertake both current consumption and investments (depending on who receives the loans and for what purpose) independent on whether resources have actually been freed or not for such purposes. This will serve to 1) reduce resources available that could have been used for other purposes, 2) reduce the existing pool of monetary savings through a reduction in its purchasing power and 3) create future economic imbalances as more is consumed or invested today than the current pool of voluntary savings suggests. In short, consumption and/or investment increases above and beyond what prior savings would have allowed with an inelastic money supply (i.e. a money supply that remains constant). The seed corn is as a result (partly) consumed carrying with it increased risk of overconsumption and malinvestment and a depletion of an economy’s available resources. This will ultimately lead to less production and consumption in the future if the pool of savings is gradually being drained and ends up needing to be replenished. Increased debt created by an elastic money supply is therefore not about “borrowing from the future” as is commonly asserted as it is never guaranteed that the future will be able to pay for today. It’s instead about consuming and investing more today than we can afford at the expense of consuming and investing less in the future. More debt and less saving today mean lower consumption and economic growth or contraction in the future and vice versa. 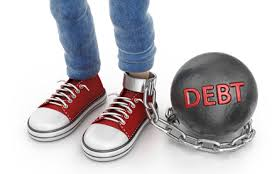 Debt unbacked by prior savings are granted in the form of increased current purchasing power for the borrower at no loss to the banks as the newly created deposits ends right back in their coffers. The borrower acquires real resources with the new purchasing power, but also needs to pay back the loan with real resources (the borrower has not got access to a printing press). I say real resources as the borrower needs to create enough profits through selling goods or services to be able to service the debt (the borrower does not own a printing press). As the initial debt depleted these very real resources, ultimately some of the borrowers will run out of real resources to pay back the loan. This is when default occurs. This usually takes the form of the borrower, a legal entity or a person, not being able to generate enough profits to service the debt and interest payments. As the debt expansion necessarily brings about pressure to consume and invest at ever greater speed, the economy at some stage runs out of the resources necessary to service the debt. The people in the economy have simply been living beyond means as evidenced by a depletion of savings. The cushion or the rainy day fund is gone. When this happens, it becomes apparent that the debt was granted at the time of a more prosperous economy when both savings and productivity were higher. The debt remains fixed however and has not declined in tandem with the regressing economy. The increased scarcity of resources brought about by overconsumption and malinvestments makes it outright impossible for all the debt to be repaid. Borrowers default as a result and lenders take losses. The economy can only start recovering by admitting these losses (laws were established long gone to handle this process, for both banks and others) and restoring the savings initially depleted which is a prerequisite for accumulating capital once again. At this stage however, even if markets and the genius of the human mind were allowed to perform their magic, it would take years to accumulate a relevant amount of saving. Without, it will take decades or may never happen at all. For more on this subject and specifically for the U.S., see an article I published recently titled Why GDP Growth Will Slide For Years To Come.